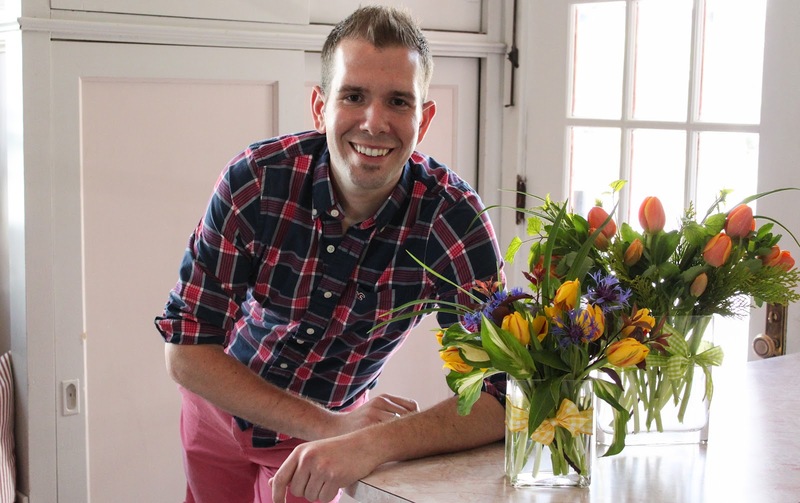 I don’t know about you, but one of the things I hate spending a lot of money on is fresh cut flowers. 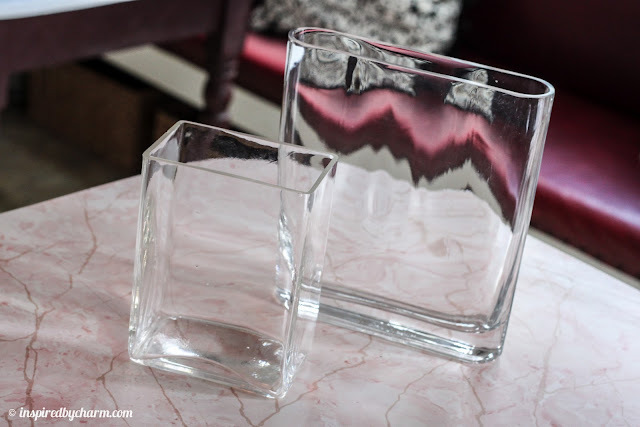 While they are beautiful and artful, they just seem to fade so quickly. Don’t get me wrong, I love fresh flowers and they really add the perfect finishing detail to any space, but I can’t afford a $50 arrangement every week. 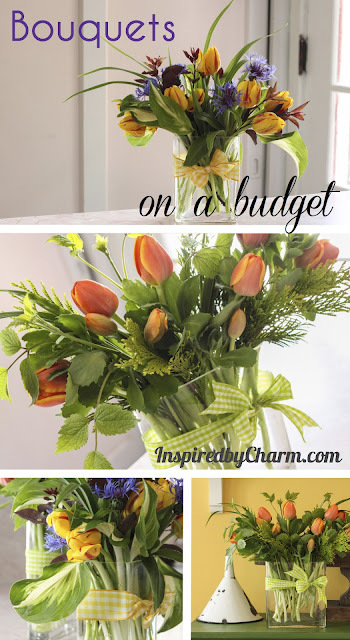 So with Mother’s day just around the corner I thought I would create and share some ‘Bouquets on a Budget’. 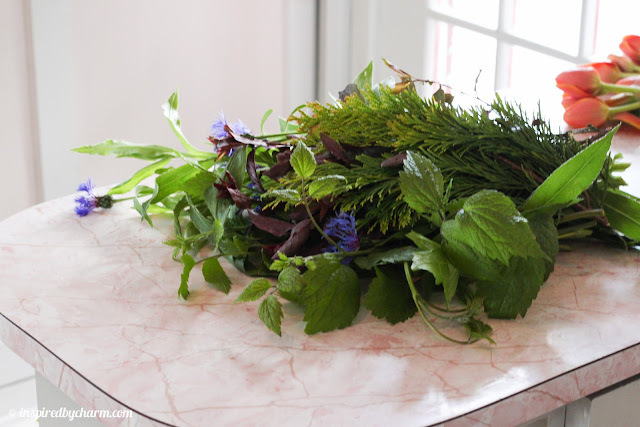 Using things I had on hand and some greenery found in my landscaping, I created two flower-shop-worthy arrangements for only $5 a piece! And I’m going to share my secrets with you today! 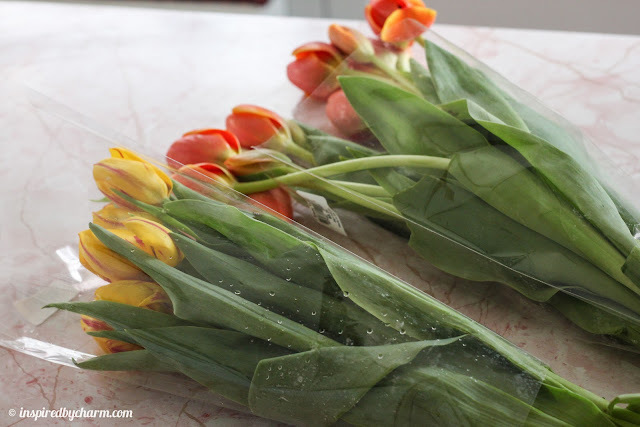 First, I stopped at Wal-Mart and picked up two bunches of tulips for $5 a piece. Then I dug through my cupboards and found a couple vases. Don’t have a vase? No problem. Use a water pitcher, an empty mason jar, a drinking glass, or whatever else you may have on hand. 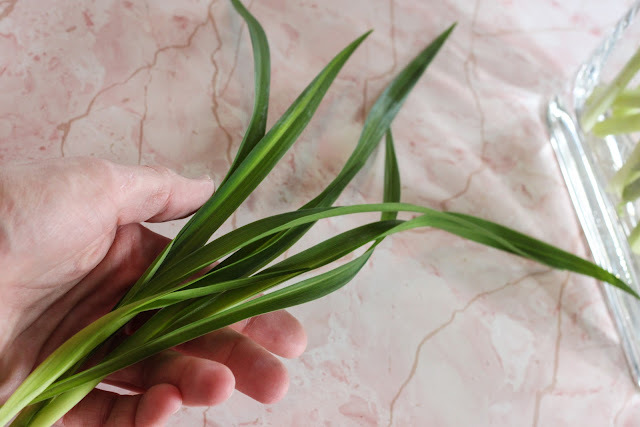 To compliment my tulips, I needed some greenery… and maybe an extra flower. 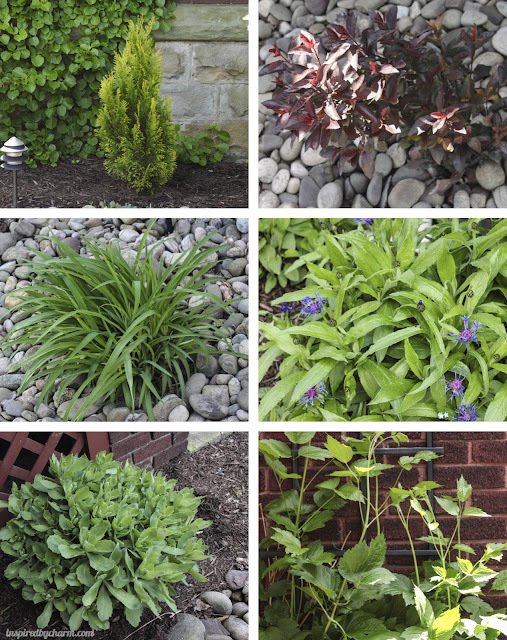 I scouted out my landscaping to see what was green and blooming. With scissors in hand, I went out and snipped a few pieces of each. 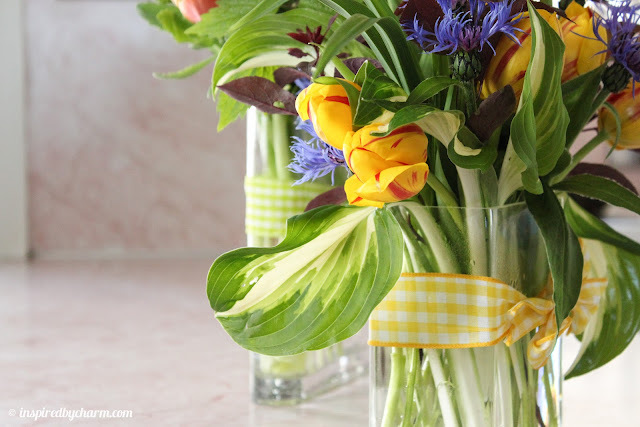 With lots of greens cut and tulips ready, it was time to start arranging. 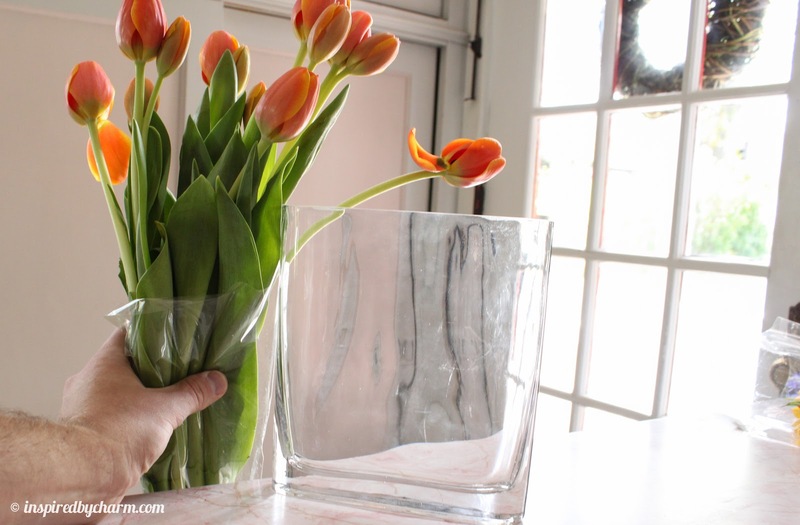 I begin by determining how tall I wanted my tulips to be in my vase. I gave them a quick cut to the length and got work cleaning them up. I cleaned off all the leaves that would below the rim of the vase. 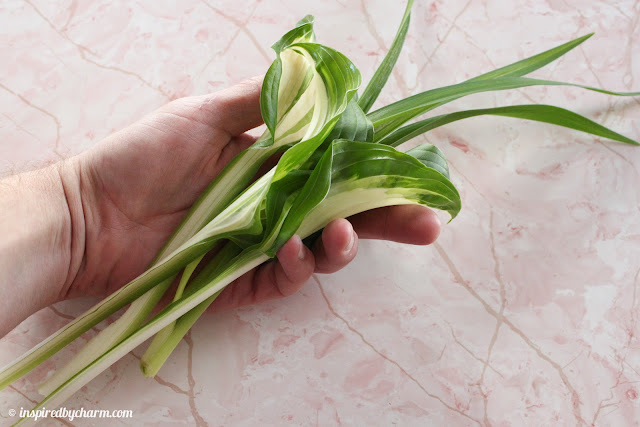 The leaves peel off very easily with just your hand. No knife or scissors required. I then did the same thing with the sedum, clearing off all the leaves that would have been below the rim of the vase. See how much better they look! 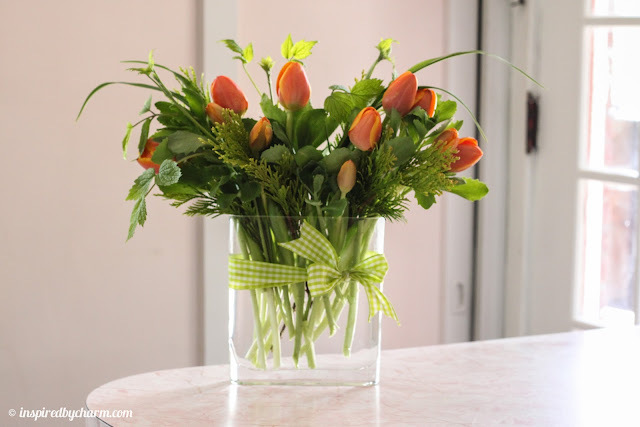 After that, I tucked the tulips in my vase and then filled in with the sedum. I repeated the same steps with my arborvitae. I really love the texture and color these give to the arrangement. After that I cleaned up my clematis leaves and tucked them into the arrangement. Almost done. Honestly, this isn’t a very fussy process, just do what feels and looks right to you. Have fun. Be fearless. I felt the arrangement needed a bit more whimsy, so I grabbed some of my daylily leaves and tucked them in on either side of the arrangement. 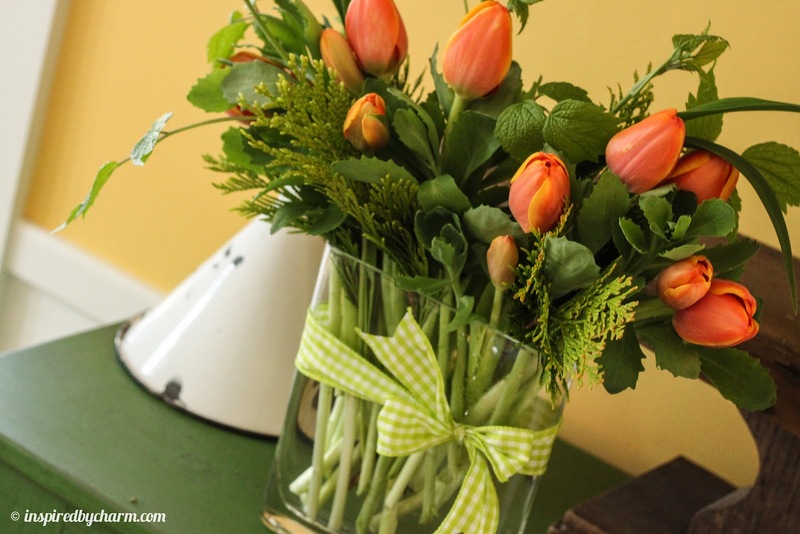 To make this arrangement look truly professional, I grabbed a piece of green gingham ribbon I had on hand and tied it around the vase creating a bow in the front. To finish off the tails of the bow, I cut in a dovetail. This can be done by folding the ribbon in half and cutting at a diagonal. I do this to all my ribbon. It really gives it a finished look. One professional looking arrangement, completed within minutes, using a $5 bunch of tulips and some greenery already growing in my yard. It doesn’t get much easier than that! Still don’t believe me? Let try another. First, measure and clean up your tulips. …and some of these purple flowers. See how much better they look after removing all of those leaves? Love that! I finished this arrangement by tucking in some hosta and daylily leaves. A quick and easy bow (if you can tie your shoes, you can make this bow) for that professional look. Honestly, it’s really that easy! 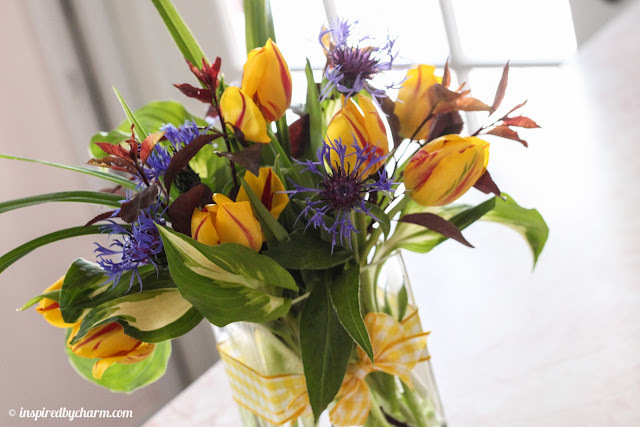 So easy that you may never pay $50 for another flower arrangement again. And this look is so much more casual and less fussy then some of the arrangements you get from the florist. Don’t you think? Want to see them set up in my house? You got it! Pretty amazing for only five bucks! A welcome and colorful addition to my little sideboard. That odd looking wood piece is a vintage ironing board for shirt sleeves. Remember I picked it up antiquing a couple weeks ago? It’s amazing the difference fresh flowers can make in a space. And now, they are even affordable! 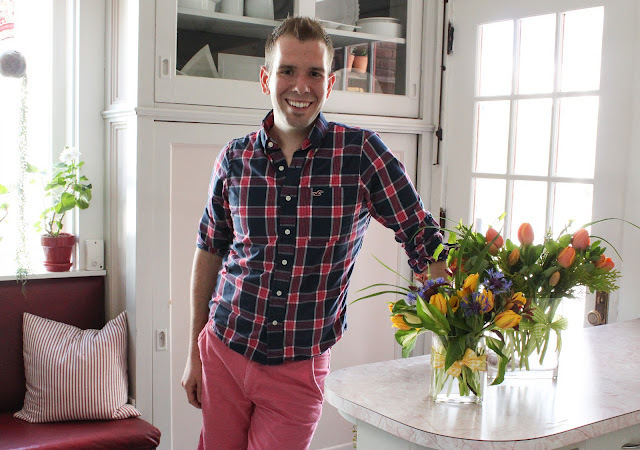 How about one more picture of me an my pink shorts? Which, by the way, I picked up at Target and totally love! Have a wonderful weekend everyone. Happy, happy Mother’s day! You amaze me everyday! Love it Michael! 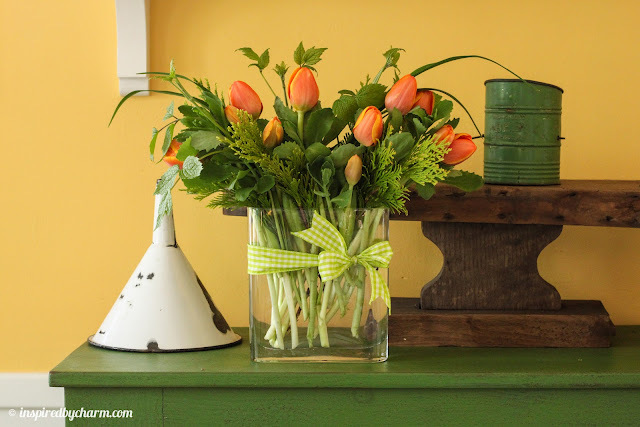 oooh…I want the peach tulips with the green gingham. Inexpensive and simple?…my kind of flower arrangement! Beautiful! Such happy, creative arrangements, Michael! Good advice about being fearless, too. Have a lovely weekend! I’m inspired! I will be trying this tomorrow as I do my yard work. Thanks so much! I love these! 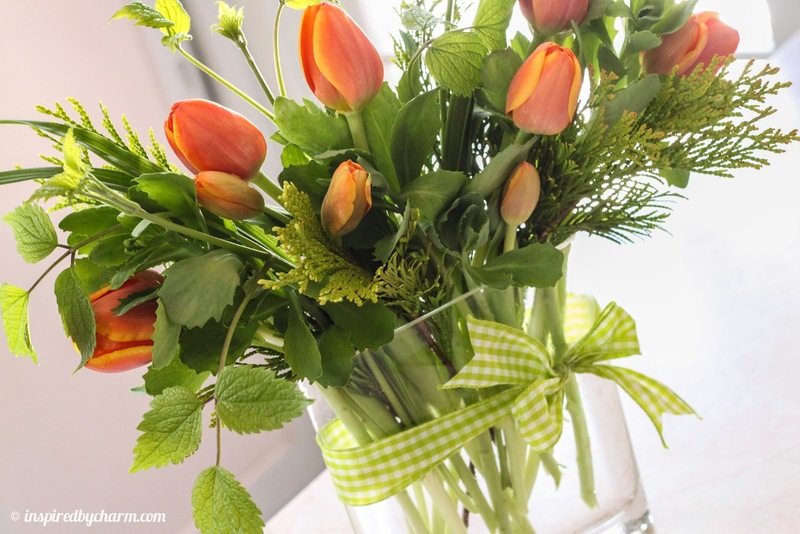 Those coral colored tulips on the green with the ironing board is so beautiful together! Spectacular… as usual. 🙂 I LOVE all the added greens! What a well kept secret that was. Nah… I’m sure you invented it. It looks amazing! Wow Beautiful Michael! You really seem to be good at everything! 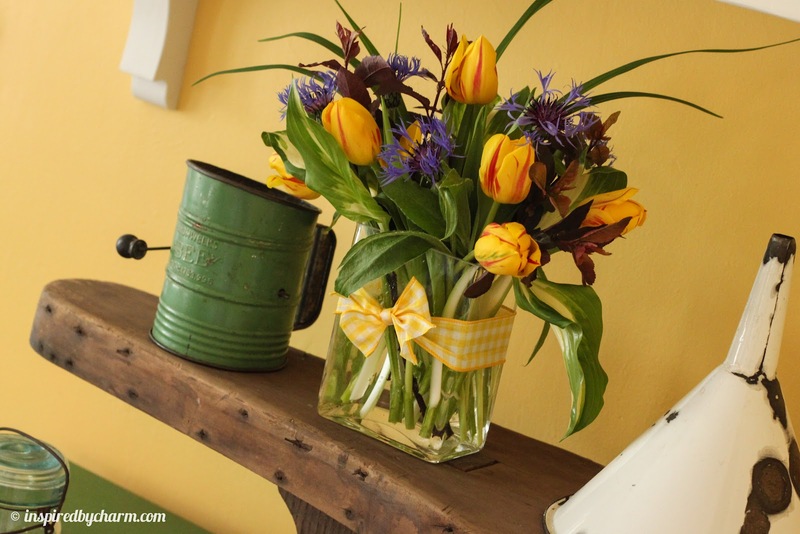 You make this look so EASY……i love fresh flowers in my home i look every week in g-store sometime’s i splurge even those prices have gone up and up…great pic’s!!! Beautiful! I need to make 10 arrangements for a party next month on a budget and I will definately be using your tips. Love your new pic and the shorts! Michael – I am in utter awe of your exquisite talent for all things beautiful. Your florals are fantastic and your photography showcases it exquisitely. Hugs! Love, love, love this!!! I have really enjoyed your pins! Can’t wait to use this idea! Super cute! I never thought of nabbing some daylily or hosta leaves. Awesome ideas as always!! I am a new follower, YAY! The flower bouquet is just perfect. Thank goodness there are people like you who willing to share their vision. I have very little decorating sense. Thank you! Those arrangements look awesome! Thanks for the tips! 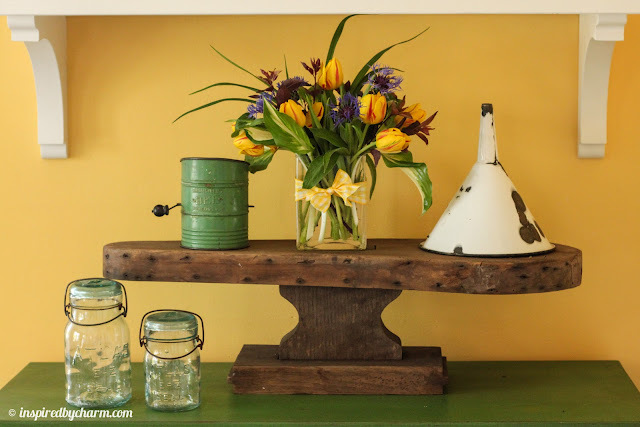 I would love to know the name of the color on your walls in the antique ironing board photos?! Love your blog! I love that your 5.00 projects always look like a million!You are so creative! Very simple and beautiful! Great job! This is obviously an older post, but I just caught it on Pinterest. Grocery store flowers are my life (I just started blogging and actually did a lil post on it). This is awesome though, thanks for the pointers haha and I like how you crossed out purple flowers, because I had no clue what I was talking about either. I love this! 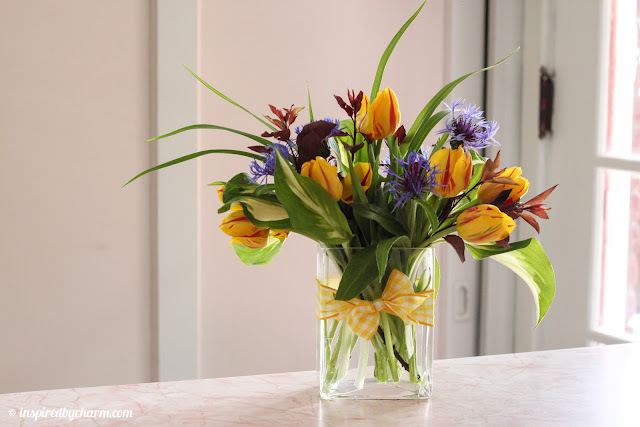 Your arrangement looks fabulous! !